Pro Rail Services Ltd. is a Railway civil engineering contractor who execute maintenance contracts on Network Rail infrastructure. This project took place on the Wessex Route. The track drainage system in the area had a history of partial collapses, which lead to numerous track flooding events. Network Rail was keen for this to be addressed as part of its planned maintenance programme. 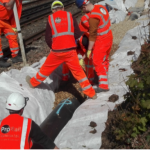 Pro Rail Services Ltd. was commissioned to replace track drainage, by installing 145 metres of new track drainage to cover both the Up and Down CESS during a 27-hour weekend daytime possession. Timescales were tight. The project was tendered five weeks before possession. Pro Rail Services Ltd. was awarded the contract with three weeks to plan the works and mobilise its teams. The Pro Rail Services Ltd. planning team quickly put together a project plan that would ensure the works could be completed safely and effectively within the 27-hour limit. The track drainage renewal teams consisted of four site managers, six engineers and 55 skilled rail maintenance operatives working across both locations. Four road rail excavators, with trained RRV operators, and a team of crane and machine controllers were also brought in. Materials, including 600 tonnes of ballast, were transported to the site by engineering trains. 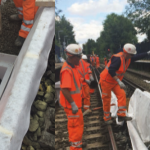 Over the 27-hour possession, the Pro Rail Services Ltd. teams installed 145 metres of new track drainage pipe at Walton-on-Thames Station. First, the old pipework had to be excavated and removed. The new pipework was 450-millimetre diameter half-perforated plastic (HDPE). Ballast was laid within trench liner membrane to prevent root ingress. Five new catchpits, made from glass-reinforced plastic (GRP) were also installed. 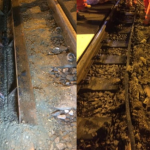 The new track drainage lines were then jetted clean and surveyed by one of Pro Rail Services Ltd.’s CCTV camera teams, to show the pipework was fit-for-purpose and fully-operational. Pro Rail Services Ltd. is a Railway civil engineering contractor who execute maintenance contracts on Network Rail infrastructure. This project took place on the South East Route. 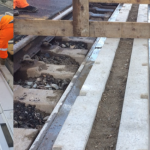 Pro Rail Services was commissioned to replace a level crossing STRAIL system on the Medway Valley Line in North Kent. This was a complex project owing to the need to repair the drainage under the crossing and the presence of buried services connecting nearby residences. Health and safety considerations included restrictive working on the level crossing, and manual handling of heavy materials and equipment. A topographical survey was carried out. Data was used to create a design approved by Network Rail South East. Work was carried out in partnership with the rail crossing system manufacturer, STRAIL. All work was undertaken under a pre-planned 27-hour possession. Extra care was needed to ensure there was no damage to the buried services. As requested by the client, steel beams were used to support the STRAIL mats. While replacing the mats, spot repairs would be made on the drainage underneath. The existing steel beams were reused and were removed and reinstalled using a 3-tonne excavator. All arisings were put in 1-tonne bags and removed from site using a lorry with a truckmounted crane. More than 50 STRAIL mats were installed. 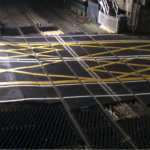 Finally, road markings were re-painted prior to the crossing re-opening. • All work was carried out safely, with no incidents reported. No services we struck. The level crossing was close to a large industrial site and had significant HGV traffic. in a poor condition, leading to numerous vehicles becoming stuck, causing significant safety hazards. The drainage running under the crossing was also in disrepair and needed to be improved. Health and safety considerations included restrictive working on the level crossing, and manual handling of heavy materials and equipment. The concrete beams, alone, weighed 0.4 tonnes per metre. Road closures were needed due to the location of the works. To minimise inconvenience to the travelling public, the project had to be completed in just 27 hours. With the high HGV traffic, a pontiSTRAIL system was used throughout due to its capacity for heavy loads. To facilitate this system, it was necessary to install concrete beams in the sixfoot and cess. This work included removing the existing steel beams using a 3-tonne excavator and installing the new concrete beams. More than 50 pontiSTRAIL mats and trays were installed, along with concrete beams weighing a total of 12 tonnes. • All work was carried out safely, with no incidents reported. Pro Rail Services was commissioned to replace a level crossing STRAIL system on the Medway Valley Line in North Kent. To facilitate the new STRAIL system it was necessary to install concrete beams in the six-foot. Due to the location of the works, road closures were needed. To minimise inconvenience to the travelling public, the project had to be completed in just 27 hours. 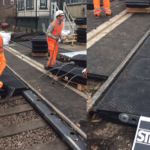 More than 50 STRAIL matts and pontiSTRAIL trays were installed, along with concrete beams weighing a total of 12 tonnes. 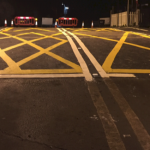 Finally, road markings were re-painted prior to the crossing re-opening. 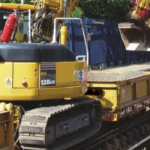 Pro Rail Services Ltd. is a Railway civil engineering contractor who execute maintenance contracts on Network Rail and TfL infrastructure. This project took place on the South East Route. Sidcup and Crayford railway stations are both on the HDR Line (Hither Green Junction to Rochester) in South East London. Both, also, had been identified as pinch points in the track drainage system, where there was heightened risk of flooding, which could affect passenger services. Network Rail was keen for this to be addressed as part of its planned maintenance programme. 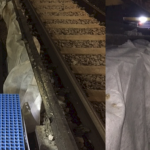 Pro Rail Services Ltd. via UKDN Waterflow was commissioned to replace track drainage at both stations, during a 12-hour weekend daytime possession. Timescales were tight. The project was tendered five weeks before possession. Pro Rail Services Ltd. was retained with three weeks to plan the works and mobilise its delivery teams. The Pro Rail Services Ltd. planning team quickly put together a project plan that would ensure the works could be completed safely and effectively at both stations, which are two miles apart, within the 12-hour limit. The track drainage renewal teams consisted of four site managers, six engineers and 75 skilled rail maintenance operatives working across both locations. Materials, including 300 tonnes of ballast, were transported to the site by engineering trains. 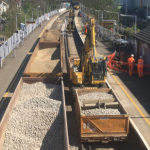 Over the 27-hour possession, the Pro Rail Services Ltd. teams installed 60 metres of new track drainage pipe at Sidcup station, and 40 metres at Crayford Station. First, the old pipework had to be excavated and removed. The new pipework was 225-millimetre diameter half-perforated plastic (HDPE). Ballast was laid within trench liner membrane to prevent root ingress. At both stations, three new catchpits, made from glass-reinforced plastic (GRP) were also installed. 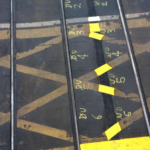 The new track drainage lines were then jetted clean and surveyed by one of Pro Rail Services Ltd.’s CCTV camera teams, to show the pipework was fit-for-purpose and fullyoperational. Network Rail is fully-appraised of scope of phase 2 works to replace remaining track drainage at Crayford Station. Pro Rail Services Ltd. is a Railway civil engineering contractor who execute maintenance contracts on Network Rail infrastructure. This project took place on the Wessex Route for Geoffrey Osborne Ltd. The drainage system in the area had a history of blockages, which lead to numerous flooding events on neighboring properties. Network Rail was keen for this to be addressed as part of its planned maintenance programme. Pro Rail Services Ltd. was commissioned to execute tree removal, de-vegetation, culvert masonry repairs, de-silting of the culvert and patch lining installation. Timescales were tight. The project was tendered five weeks before commencement. Pro Rail Services Ltd. was awarded the contract with three weeks to plan the works and mobilise its teams. 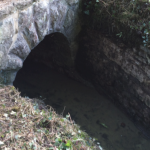 The Pro Rail Services Ltd. planning team quickly put together a project plan that would ensure the works could be completed safely and effectively at both culvert ingress and egress portals. The team consisted of one site manager and five skilled rail maintenance operatives. Materials, including cement and masonry, were transported to the site by highway based vehicles. 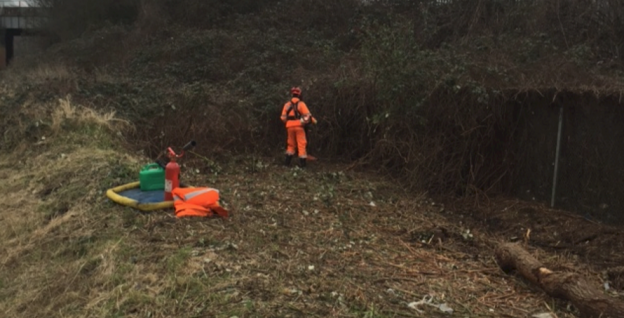 Over 10 mid-week shifts, heavy vegetation and trees were removed by Lantra and NPTC competent operatives. Once this phase was complete, the process of removing over 25 tonnes of silt commenced in order to enhance the space in the culvert to facilitate repair works. 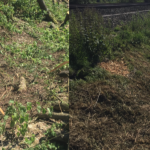 Following the completion of the tree felling, devegetation, damming of the culvert and removal of channel silt, the required masonry replacement and joint repairs were then executed in accordance to programme and specification. 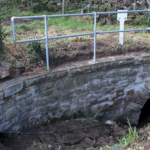 All operatives involved with the culvert repair works were competent confined space operatives using equipment calibrated and checked prior to execution on site. Pro Rail Services Ltd. is a Railway civil engineering contractor who execute maintenance contracts on Network Rail infrastructure. This project took place on Network Rail’s South East Route of the network. 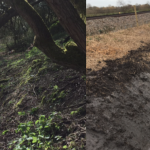 Pro Rail Services Ltd. was commissioned to carry out three large packages of work to extensively improve trackside drainage ditches and rail culverts at multiple locations across its operational region. The programme involved many locations highlighted by the Office of Rail Regulation (ORR) as having embankment and flooding issues. All the sites were surveyed before work was carried out. Detailed project safety, environmental and logistical plans were drawn up for each package. Work was scheduled with the agreement of Network Rail Works Delivery South East Route. Teams of specialist de-vegetation and access contractors with the right qualifications, skills and experience were put together. This included arborists, excavation crews, plant operators and drainage survey operatives. SSOWP risk assessments and work package plans and task briefs were prepared for all projects, and all three projects were F10 notifiable. Work began in mid-August 2016 and is scheduled to finish at the end of 2017. All sites have been visited and scoped. 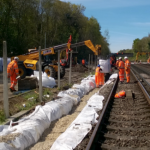 All work to-date has been carried out with a mix of daytime working and possessions with progress monitored through weekly meetings with Network Rail. 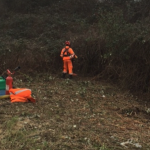 • Resources deployed have been a fiveperson de-vegetation team, supported by excavator and dumper crews, plus an array of safety critical resources. • Culverts and track drainage lines are identified and their locations recorded. • Where necessary, de-vegetation takes place. • Culverts are dewatered through overpumping. • Cleaning is carried out using water jetting. • Asset condition surveys are carried out. • Resources deployed include 10 operatives per site, a jet vac tanker, water tanker, offroad tracked Porta Reel, a CCTV camera survey team, and a 6-inch water pump. 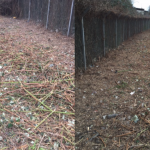 • Vegetation and trees removed along 7,650 metres of trackside drainage ditch. Where necessary, ditches have been reprofiled. • 38 under-track culverts have been cleaned and surveyed. In some cases, recommendations have been made to line the culverts or rebuild headwalls. • Approximately 13,500m of track drainage completed across two routes (KJE2/3 – 7,500m, VTB3 – 6,000m) was maintained. Where necessary, recommendations have been made to carry out repairs to resolve a range of problems, including pipe cracking and collapses. 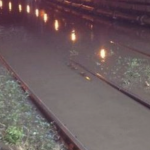 Rail services through Belvedere Railway Station in the London Borough of Bexley were being compromised by poor track drainage causing wet beds. This resulted in temporary speed restrictions having to be put in place, adversely affected the reliability of passenger services. The main cause of the problem was the lack of track drainable assets at the station. Pro Rail Services Ltd. was commissioned to install 170 metres of new track drainage. This was made up of semi-perforated high density polyethylene (HDPE) pipe (internal diameter: 225mm), linked via 6 glassreinforced plastic (GRP) catchpits. Initially, the track drainage was designed to outfall into an existing culvert. However, it was identified that project costs could be reduced by moving the outfall to a ditch nearer to the station. The change was approved 10 days before the implementation date. However, Pro Rail Services Ltd. still had time to introduce an innovation. In what is thought to be a first for track drainage, the pipe outfall was established with a GRP headwall, instead of a concrete one. • Reduced cost, due to no need for hire of lifting equipment and easier transportation. A railway drainage systems manufacturer, Aqua, was commissioned to design and supply the GRP headwall. The track drainage system was installed during a 52-hour possession between 7-10 April 2017. Work was carried out in 12-hour shifts, with 50 track drainage personnel working on each shift. 4x road-rail vehicles (RRVs: 2x PC118, 2x PC138), 2x 5-tonne excavators and 2x trailer units were used to carry materials and equipment to and from the worksite. At one point, work had to be suspended for three hours, and all equipment and materials were demobilised and transported to a depot three miles away, to allow two tamper trains to travel through the station. Early indications are that the wet beds that were previously identified have been removed. A new method for creating a track drainage outfall, using a GRP headwall, has been implemented. This technique can now be used again elsewhere, generating the benefits described above. The track drainage was installed according to the programme and on budget. The GRP headwall was installed successfully and performed in line with specification. No incidents or accidents were reported. Pro Rail Services Ltd. is a Railway civil engineering contractor who execute maintenance contracts on Network Rail infrastructure. This project took place on the South East Route of the network. The track drainage system in the area had a history of blockages, which lead to numerous track flooding events induced by high vegetation to the drainage ditches. Network Rail was keen for this to be addressed as part of its planned maintenance programme. 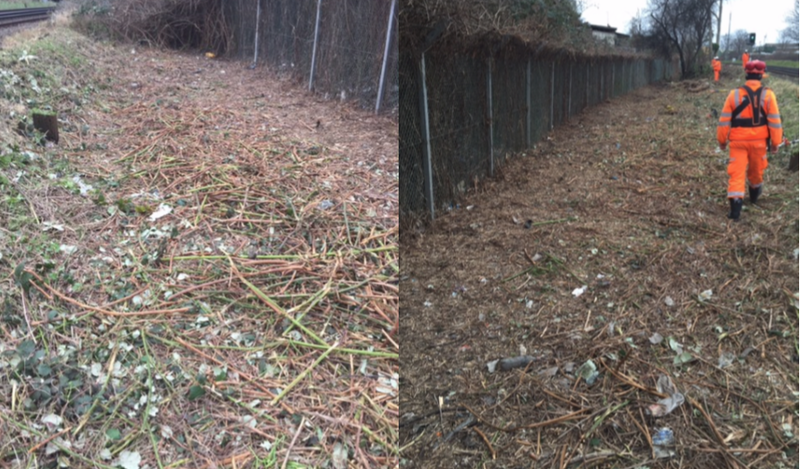 Pro Rail Services Ltd. was commissioned to brushcut a 1000m section of CESS 3m wide to clear the drainage ditch to allow water to flow. The project was tendered five weeks before possession. Pro Rail Services Ltd. was awarded the contract with three weeks to plan the works and mobilise its teams. 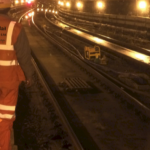 The Pro Rail Services Ltd. planning team quickly put together a project plan that would ensure the works could be completed safely and effectively. The teams consisted of one site manager, one engineer and 12 skilled de-vegetation operatives working across the site. Over the five-week programme, the Pro Rail Services Ltd. teams removed a 1000m x 3m section of thick vegetation.